It might be a shock to Americans, as Ford has been selling hybrids for over ten years, starting with the Escape, but it has yet to sell the first one in Europe. The Ford Escape hybrid has never been imported here, and the C-Max only offers a choice between gas and diesel. So here comes the Fusion, which is known over here as the Mondeo. The new generation, which launched some 18 months ago in America, is finally crossing the Atlantic. The new Mondeo will be available with gas and diesel engines, as always, and for the first time ever in Europe, in a hybrid version. There aren’t many details so far, but differences between the American and European models should be minimal. Changes should be limited to some suspensions settings (drivers expect excellent control here, eventually at the expense of comfort), and some trim/cosmetic parts. Engine will remain a two-liter four and the electric motor will gets its juice from a 1.4-kWh battery. 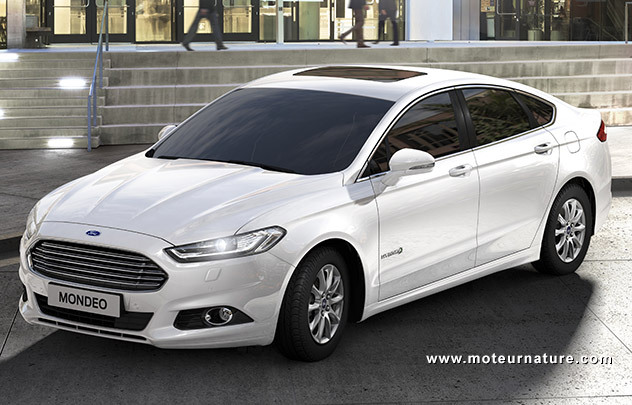 The new Mondeo will launch at the Paris motor show in October, and be available in most of European countries in the following weeks. I’m personally very grateful to Ford for remembering, at last, that there are people enjoying hybrids all over Europe. Most of them own a Toyota, so it’s about time Ford enters this important market. Even if as of today, it’s more important for image than for sales.